Recent research by Suresh, Dao, and Yang Lu, a former MIT postdoc now at City University of Hong Kong, showed that even diamond, the strongest and hardest material found in nature, can be elastically stretched by as much as 9 percent without failure when it is in the form of nanometer-sized needles. Li and Yang similarly demonstrated that nanoscale wires of silicon can be stretched purely elastically by more than 15 percent. These discoveries have opened up new avenues to explore how devices can be fabricated with even more dramatic changes in the materials' properties. Unlike other ways of changing a material's properties, such as chemical doping, which produce a permanent, static change, strain engineering allows properties to be changed on the fly. "Strain is something you can turn on and off dynamically," Li says. That's where this team's novel application of machine learning methods comes to the rescue, providing a systematic way of exploring the possibilities and homing in on the appropriate amount and direction of strain to achieve a given set of properties for a particular purpose. "Now we have this very high-accuracy method" that drastically reduces the complexity of the calculations needed, Li says. "Tuning" of a bandgap can be a key tool for improving the efficiency of a device, such as a silicon solar cell, by getting it to match more precisely the kind of energy source that it is designed to harness. By fine-tuning its bandgap, for example, it may be possible to make a silicon solar cell that is just as effective at capturing sunlight as its counterparts but is only one-thousandth as thick. In theory, the material "can even change from a semiconductor to a metal, and that would have many applications, if that's doable in a mass-produced product," Li says. While it's possible in some cases to induce similar changes by other means, such as putting the material in a strong electric field or chemically altering it, those changes tend to have many side effects on the material's behavior, whereas changing the strain has fewer such side effects. For example, Li explains, an electrostatic field often interferes with the operation of the device because it affects the way electricity flows through it. Changing the strain produces no such interference. 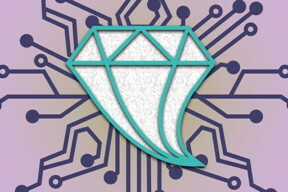 Diamond has great potential as a semiconductor material, though it's still in its infancy compared to silicon technology. "It's an extreme material, with high carrier mobility," Li says, referring to the way negative and positive carriers of electric current move freely through diamond. Because of that, diamond could be ideal for some kinds of high-frequency electronic devices and for power electronics. Whereas this study focused specifically on the effects of strain on the materials' bandgap, "the method is generalizable" to other aspects, which affect not only electronic properties but also other properties such as photonic and magnetic behavior, Li says. From the 1 percent strain now being used in commercial chips, many new applications open up now that this team has shown that strains of nearly 10 percent are possible without fracturing. "When you get to more than 7 percent strain, you really change a lot in the material," he says.